But at heart, he will always be a Midwesterner and grateful for his Catholic education, he told students at his alma mater. Clements, a 1971 alum of the Bishop Heelan High School in Sioux City, visited with students Sept. 13. He was in Sioux City as a major presenter at the Sioux City International Film Festival, held Sept. 12-16. As a Crusader, the school’s mascot, Clements was recognized for his artistic talent as the staff cartoonist at the Heelan student newspaper, Heelan Highline. Journalism teacher Mary Castle, who attended Clements’ video presentation, insisted she knew her student would flourish in his life’s work. At 15, Clements worked at KCAU-TV, Channel 9, the Sioux City ABC affiliate, where another Heelan graduate George Lindblade and Heelan parent Bill Turner — both associated with the station — helped Clements with his journey to Disney. Clements crafted a hand-drawn, 15-minute film in which he did all the aspects, including the voices. “Shades of Sherlock Holmes” caught the attention of folks at Hanna-Barbera, a cartoon producer. That led to where Clements has spent the bulk of his career – at Disney Animation Studios in Los Angeles. With John Musker, Clements co-directed “Moana,” “The Little Mermaid,” “Aladdin” and “The Princess and the Frog” — all films nominated for Academy Awards. He also helped supervise, animate or write “The Great Mouse Detective,” “Hercules” and “Treasure Planet,” to name a few. In the Kiddie Crusaders Preschool across the street from the high school, Clements waxed nostalgic about taking art classes in the same building more than four decades ago, taught by Sister Mary de Lourdes, a Sister of Christian Charity. The kids serenaded Clements with the hit song “How Far I’ll Go,” while “Moana” played on a large screen TV. To repay that graciousness, the left-handed animator stood at a white board and drew characters Pua the Pig and Hei the Rooster from “Moana,” which was released in theaters in November 2016 and on DVD in March 2017. 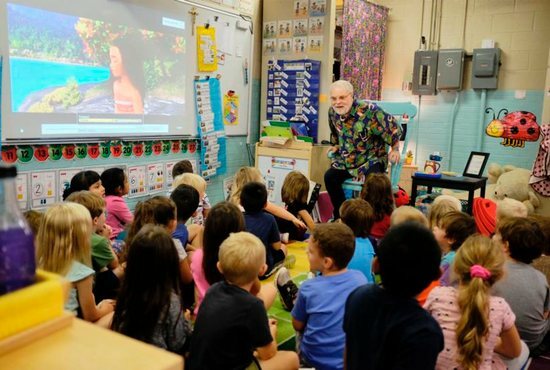 Clad in an ocean-blue shirt, with “Moana” colorful characters, Clements — with a good growth of facial hair — was clearly out of uniform, but emphasized he never had detention at school. It was a trip down memory lane for Clements, as he visited the former school, set to be razed sometime in the future, and was in awe at the new $30 million Bishop Heelan High School. The 65-year-old Clements credited instructors who provided a strong base for his livelihood. The education Clements received also was important in his career. The film festival presented “Moana” at the Orpheum Theatre in Sioux City, the movie house where 9-year-old Clements first saw “Pinocchio” and fell in love with animation. “I sort of decided somewhere in my head that’s what I want to do with my life. I want to be an animator. I want to work at Disney and that’s what led me there,” he said.